Why is the consumption of alcohol prohibited in Islam? Alcohol has been the scourge of human society since time immemorial. It continues to cost countless human lives, and causes terrible misery to millions throughout the world. bear mute testimony to the destructive power of alcohol. Eschew such (abomination), That ye may prosper." deceived thereby is not wise." b. "And be not drunk with wine." does not normally use abusive language while addressing his parents or elders. from doing so in public. Therefore he uses the toilet. do they talk nor walk properly. They even misbehave. committing the crime. The same is true in cases of molestation. are due to intoxication of one or both the persons involved. Many may argue in favour of liquor by calling themselves ‘social drinkers’. that I have never been intoxicated even a single time. shameful, it will remain with him for a lifetime. are irreparably and irreversibly damaged. "Alcohol is the mother of all evils and it is the most shameful of evils." "Anything which intoxicates in a large quantity, is prohibited even in a small quantity.
" Thus there is no excuse for a nip or a tot. According to Sunan Ibn-I-Majah Volume 3, Book of Intoxicants, Chapter 30 Hadith No. 3380. "God’s curse falls on ten groups of people who deal with alcohol. the one who buys it and the one who buys it for someone else." related to any one particular cause is due to the consumption of alcohol. Millions of people die every year only because of intake of alcohol. 1. Cirrhosis of Liver is the most well known alcohol associated disease. Cancer of Liver (Hepatoma), Cancer of Bowel, etc. Angina and Heart Attacks are linked with heavy alcohol intakes. are well-known syndromes caused by alcohol consumption. 8. Beriberi and other deficiencies are not uncommon among alcoholics. Even Pellagra occurs in alcoholics. may cause death even if treated in well equipped centres. and Hyperlipaedemia that follows alcoholic binges. 12. Thrombocytopenia and other platelet abnormalities are not rare in alcoholics. 13. The commonly used tablet metronidazole (flagyl) interacts badly with alcohol. 14. Recurrent infection is very common among chronic alcoholics. The resistance to disease and the immunological defense system are compromised by alcohol intake. Emphysema and Pulmonary Tuberculosis are all common in alcoholics. even cause suffocation and death. pregnancy alcohol consumption has a severe detrimental effect on the foetus. Foetal Alcohol Syndrome is being recognised more and more in the medical profession. 18. Skin diseases are also related to alcohol indulgence. alcoholism a disease rather than an addiction. Allah (swt) in His Infinite Wisdom has warned us against this snare of Satan. deviation from this natural state, for the individual as well as for society. It degrades man to a level below that of the beasts he claims to be superior to. 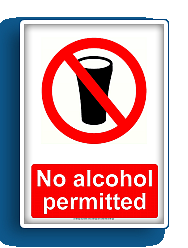 Hence the consumption of alcohol is prohibited in Islam.